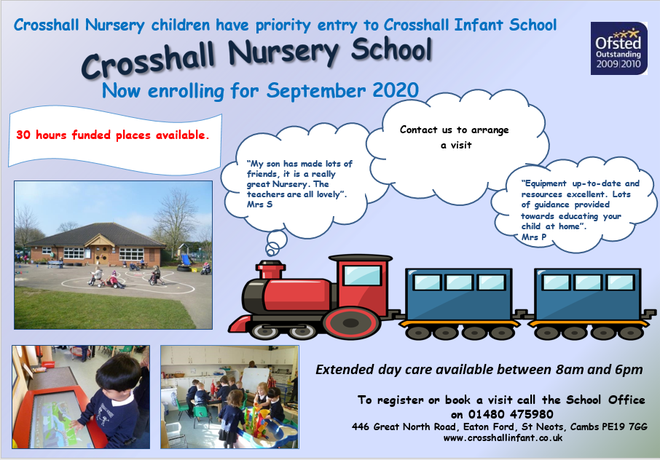 We currently have afternoon vacancies in the Nursery School and are taking Nursery admission applications for September 2020. If your child was born between 1st September 2016 and 31st August 2017, they are eligible to receive 15 hours of government funded Nursery education at our Nursery School from September 2020.They may also be eligible for a further 15 hours funded childcare. Please check eligibility at the Government’s Childcare Choices website www.childcarechoices.gov.uk . If your child is already 3 years old, Kids Club can provide these 30 hours from January. They can also provide wrap around care between 8am and 6pm and during school holidays. Open Evening and Open Day sessions are in January. Please see the attached flyer for more information. Please note that the registration period closes on 31st January 2020. Wide range of high quality resources Curriculum based on "The Early Learning Goals"